To make his recollections of where he had been even more endearing, Hubbard took the time to hand tint nearly all of his photographs. He would say swabbing and glazing the Marshall oil colors onto his black and white enlargements gave him one more opportunity to re-live his experiences in these out of the way places. 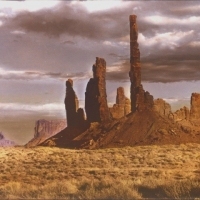 Hand tinted vintage black and white photographs of popular viewpoints and remote areas of the Navajo Nation throughout the northern reaches of Arizona. Hand tinted vintage black and white photographs of popular viewpoints and remote areas of Arizona's Grand Canyon. Hand tinted vintage black and white photographs of natural arches and remote canyons throughout the Colorado Plateau. Hand tinted vintage black and white photographs of Glen Canyon prior to the dam and as Lake Powell was filling. Back when photography was strictly a black and white process, hand tinting became popular as a means to a more real life effect, though decidedly more subtle and impressionistic than modern color photography. While the practice enjoyed something of a revival in the mid-1960s, by then Hubbard had already earned awards and accolades nationwide for his sizable portfolio of hand tinted images of the landscape and culture in these regions he practically called home.